Sudanese president Omar al Bachir has been toppled and arrested by the army after 30-year of autocratic rule and months of anti-regime protests. The announcement was made Thursday by defense minister Ahmed Awad Ibn Aouf in a statement broadcast on state TV. He said that a military council would take over for two years, after which elections would be held. The army General also announced a three-month state of emergency and release of political prisoners. Although the removal of Bashir was initially welcomed with joy on the streets of Khartoum elsewhere, but that rapidly turned to anger when details of the new government became clear. Protesters continued Thursday to pour in the streets, expressing their rejection of the new rulers’ plans. A spokesman of the Sudanese Professionals Association (SPA), which has been organizing the massive demonstrations, said “we do not accept the government by the army for the next two years … The regime remains the same”. The protests in Sudan, one of Africa’s biggest and most strategically important countries, started in December in the eastern city of Atbara after a government decision to triple the price of bread, but quickly evolved into nationwide demonstrations against Al Bashir regime. Al Bashir seized power in a military coup in 1989. 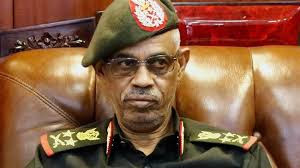 He is the subject of an international arrest warrant issued by the International Criminal Court (ICC), which accuses him of organizing war crimes and crimes against humanity in Sudan’s western Darfur region. It is not clear what will happen to him following his arrest. Al Bachir’s rule has been marked by civil war. The civil conflict with the south of the country ended in 2005 and South Sudan became independent in 2011. Another civil conflict has been taking place in the western region of Darfur. Despite an international arrest warrant issued by the ICC, he won consecutive elections in 2010 and 2015. Written by: Jaber Ali on April 11, 2019. Posted by Jaber Ali on Apr 11 2019. Filed under Headlines, World News. You can follow any responses to this entry through the RSS 2.0. Both comments and pings are currently closed.